Thy riches and wealth didst thou disperse unto the poor; thou now hast received the Heavens' riches in return. For this cause, O all-wise John, we all honour thee with our songs of praise as we keep thy memorial, O namesake of almsgiving and of mercy. 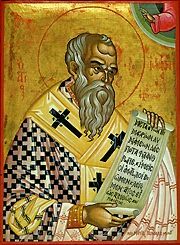 Share the feast of John the Merciful, Patriarch of Alexandria with an icon greeting ecard.